What skills will you learn with this Java course? Description: Create a new system to automate the following regulation creation and closure process: Admin will be able to add new regulations and assign them to the department. Department Head will send these regulations to individual users via email to get their consent. Users will send their comments through the courier service after reading regulations. Department head will collect user inputs and pass them on to Admin. Description: Build a system that helps individuals buy insurance for a home through a web application. You will work on automating the entire manual process that takes place between a user and a bank to complete the process. Who should take this Java training course? Why should you take this Java certification training course? Java is the most popular programming language in use and is the only language that works across all computer and Android mobile platforms without needing to be recompiled for each one. Java is widely used for developing cutting-edge applications for web or mobile platform and acts as the stepping stone for anyone hoping to advance their career in mobile development. Excelling in Java also prepares you for a career in Big Data, as Hadoop (the most widely used framework of Big Data architecture) uses Java for design and development. Demand for Java developers has never been higher, with salaries averaging more than $102,000 per year. 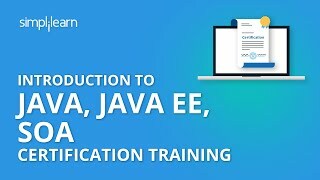 What are the prerequisites for this Java certification course? There are no prerequisites for taking this Java online course. You need not have any programming knowledge, only a keen interest in learning the extremely popular programming language. Simplilearn's Java Certification course is simple yet effective. The trainer was helpful and gave examples which made the content easy to understand. I would highly recommend Simplilearn. I have enrolled for Simplilearn's Java Certification Training. The content is very informative. The trainer is knowledgeable and his skills of explaining the concepts are awesome. Who delivers the Java training? All our trainers are certified and are highly qualified, with more than 10 years of experience in implementing Java. All of the classes are conducted via live online streaming. They are interactive sessions that enable you to ask questions and participate in discussions during class time. We do, however, provide recordings of each session you attend for your future reference. How can I learn more about this Java training program? Yes, we offer group discount options for our training programs. Contact us using the form on the right of any page on the Simplilearn website, or select the Live Chat link. Our customer service representatives will give you more details. How do I enroll for the Java online training? We offer 24/7 support through email, chat, and calls. We also have a dedicated team that provides on-demand assistance through our community forum. What’s more, you will have lifetime access to the community forum, even after completion of your Java online course with us. Simplilearn offers Flexi-pass, allowing you to attend classes at your convenience to accommodate your busy schedule. With Flexi-pass, Simplilearn gives you access to as many as 15 sessions for 90 days.